After the war of the DAWs and electric guitars, now is the turn of high-end amp emulators! Once again we asked our French community to share with us their preferences regarding high-end amp emulators. We intentionally reduced the list to the most important and reputed options on the market. The question we asked our French community was: Which is your favorite high-end hardware amp emulator? After counting the responses, one thing is clear: the Kemper Profiler is king! With 41% of the votes, the Profiler landed comfortably the first spot. Available as an amp head, poweramp or rack, the Profiler really made an impact with it revolutionary function to copy an amp. Just imagine: you can literally copy ("profile") the sound of any amp you want and save it to use it whenever you want. Add to that a simple and intuitive design, the recent addition of multiple effects and you end up with a definite must-have of high-end amp modeling! The Axe-Fx by Fractal unsurprisingly was the runner-up. But its score (26%) is significantly lower than that of the Profiler. Nevertheless, the Axe-Fx is one of the most comprehensive solutions out there. Available in many formats and enjoying a good reputation for its sound, this Fractal beast is capable of any feat thanks to its huge amount of settings and multiple inputs and outputs. Like the Kemper, the Axe-Fx even allows you to clone an amp! The only drawback is that its interface is too bare-bones and you can easily get lost with the possibilities available. 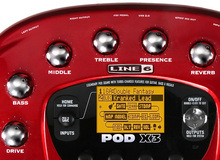 The Line 6 Helix completed the podium. One of the latest arrivals into the world of amp simulation, the Helix snatched almost as many votes (23%) as the Axe-Fx. We must admit that Line 6 really made a splash with this unit, whose design is extremely well thought-out. It doesn't matter if you go for the pedal or rack version, you will find your way in no time. The Helix stands out from the rest due to one crucial thing: effects. They are plentiful, varied and good-quality, which will delight lovers of sound experimentation. Finally, Positive Grid and Headrush got a cold shower. Their amp emulators only got 6% and 3% of the votes, respectively. Although this needs to be put into perspective, because they are pretty new, especially the Headrush, and their built-in technologies have already proved their worth (with Bias Amp and Eleven Rack).